Form 10IA of the Income Tax Department must be filed by taxpayers claiming income tax deduction under Section 80DD. Section 80DD deduction can be claimed by taxpayer, both individuals and HUF, supporting a disabled dependent. The maximum deduction allowed under section 80DD is Rs.75,000 for dependents with disability. For maximum deduction allowed under Section 80DD is increased to Rs.1,25,000 for taxpayers supporting a disabled dependent with severe disability. Neurologist having a degree of Doctor of Medicine (MD) in Neurology (in case of children, a Paediatric Neurologist having an equivalent degree). Civil Surgeon or Chief Medical Officer in a Government hospital. 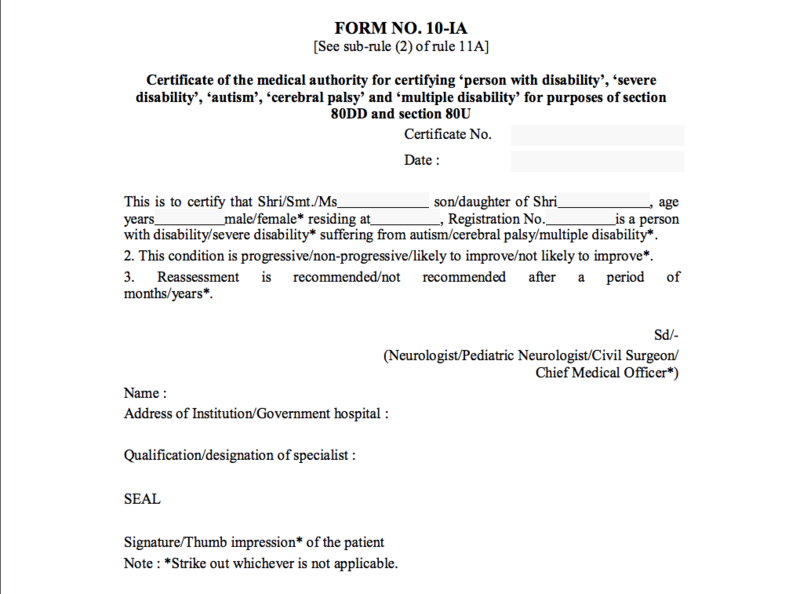 If the condition of disability is temporary and requires reassessment after a specified period, the medical certificate will be valid for the period starting from the assessment year relevant to the previous year during which the certificate was issued and ending with the assessment year relevant to the previous year during which the validity of the certificate expires.